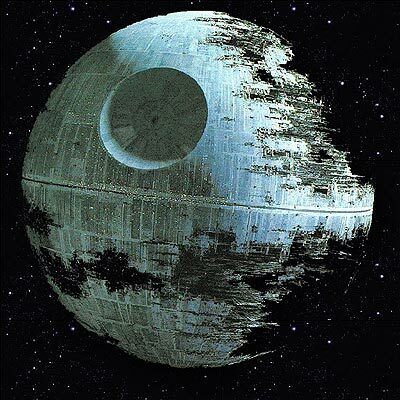 The Death Star is an all purpose best in the battle between armaments. With the size of a small moon, it carries an exceptionally powerful graviton weapon, even capable of destroying whole planets. The huge size critically brings down the velocity of this type of ships. It has an enormous structure and a unbelievable transport capacity. During an attack with a Death Star, the attacker has the chance to destroy the planet (3% for every Death Star that the attacker has more than the defender and a maximum of 30%) and to destroy one level of every building on the planet (8% for every Death Star that the attacker has more than the defender and a maximum of 50%). Cargo: 1 000 000 Attack: 1 000 000 Ship hull: 10 000 000 Speed: 100 Gas consumption: 1 Cost: 5 000 000 Metal, 4 000 000 Crystals, 1 000 000 Gas Weapon: Ion; Armor: 25% Solid; Improvements in Factory: 15% per level. After the end of the rounds in a battle with Death Star, the game determines whether the ship will destroy the planet or not. All Death Stars have the chance for destroying the planet or a building - alive or dead after the end of the battle. When both the Attacker and the Defender have Death Stars, only the ones that the Attacker has in advantage are taken into account (example - if the Attacker has 4, and the Defender has 1, than only 3 of the Attacker's Death Stars will have the chance to destroy the planet or a building). If the planet is being destroyed, the battle ends (no Recycle Fields are left from the planet, and the Defender loses not only the planet, but all units that are currently on this planet, without losing points). If the planet survives, then the chance for a Death Star to destroy buildings is calculated like this: 1/2 Death Star(s) - 50% chance to destroy ONE LEVEL of ONE BUILDING. 3/4 Death Stars - 30% chance to destroy TWO LEVELS of ONE BUILDING. 5 or more than 5 Death Stars - 40% chance to destroy ONE LEVEL of ALL BUILDINGS. On Universe 2 players can have only one Death Star for each account. After being destroyed, you can build a second one.